If you currently own or live in a small property such as condominiums, you will find that most of the ready-made beds are way too space consuming for the limited space that you have. One of the more popular options for space efficient furniture these days is customizing. This does not only provide space efficiency, this also adds more personality to the entire space. 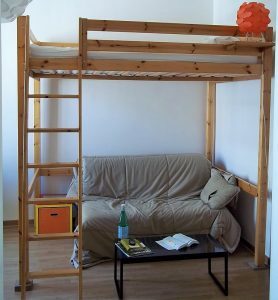 When it comes to space efficiency, nothing will beat a well-built loft bed. This type of bed allows you to maximize the space for two different purposes. You can either use the bottom part as the closet or study area. Others may still opt to use the area as additional bed space. Either way, you get to make the most of that one corner in your home. Although there are now a lot of pre-made loft beds available, having it customized by an experienced handyman will ensure that your loft bed is sturdy enough, and is really the perfect size for the available space that you have. Platform bed is perfect for those who have issues with storage around the limited space in the house. You can basically turn this bed into your extension closet, and put in whatever you prefer to be accessible from your bedside. This type is of bed is also versatile enough for you to incorporate your design taste. You can achieve an industrial look, or a more boutique style bed. The best part is, you’ll probably be spending less for a customized platform bed, but with a more expensive look. This one may require more skilled hands to be perfected. Most of these beds are made of metal, but if you can have it done using high quality wood, it would be better. This type of bed is ideal for homeowners who are constantly expecting guests, but do not want to consume too much space for extra beds. You can just un-stack or unfold the bed whenever needed. When stacked, the bed also looks sturdy and neat enough for your small space. There are still hundreds of beds to choose from. You can even combine each type, given that you find a creative and experienced carpenter or handyman to do it for you. One of the perks of having your beds customized is that you can also ensure the durability of the bed that you are having. Make sure that you are hands on throughout the entire process from choosing the materials to the construction phase. Small spaces do not have to hinder you from having an organized and cozy living conditions. It only takes some creativity and a skilled handyman to achieve this.